Carefully separate the lobes of the shad roe and season it with salt and pepper on both sides. Set aside. Heat up pan over medium heat and add 1 tablespoon of butter and a swirl of olive oil. Make sure that the bottom of the pan is evenly coated. Add the chopped garlic and move it around in the pan with a spatula until it turns golden. 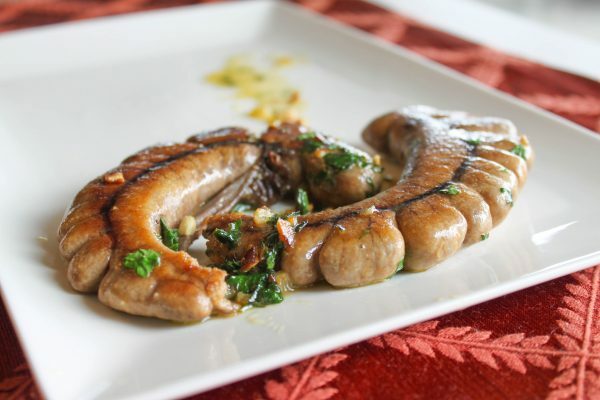 Gently lay the shad roe into the pan and let it brown for 3 to 5 minutes on each side. It should feel firm, like a medium cooked steak. Set on a plate. Lower the heat and add the remaining tablespoon of butter to the pan with the chopped parsley until it has softened and mixed well with the garlic bits in the pan. Squeeze in the lemon juice to loosen it into a sauce. Add a little bit more butter or olive oil, if necessary. Taste and adjust the flavor. Spoon the sauce over the shad roe.